Cleveland Cavaliers owner Dan Gilbert is cooling off. It may have something to do with being fined $100,000 by NBA commissioner David Stern for his open letter to embattled former player LeBron James. 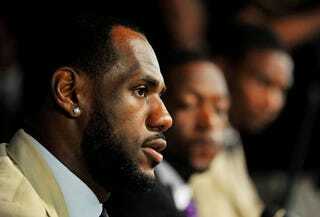 James announced that he was leaving Cleveland for the Miami Heat during a prime-time special on ESPN. We're not sure if it was James leaving or how he left, but Gilbert clearly lost his mind in the process. His response to the Rev. Jesse Jackson's comments likening him to a slave master were a little more studied. He stated, "I strongly disagree with Rev. Jesse Jackson's recent comments, and we are not going to engage in any related discussion on it." If only he had used that approach to express his dismay with Mr. James.